This latch serializes access to the objects in the library cache. Every time a SQL statement, a PL/SQL block or a stored object (procedure, package, function, trigger) is parsed or executed, this latch is acquired. Excessive execution of a statement can cause library cache contention. Use bind variables whenever possible. Reuse of code means less parsing and less use of shared pool space. Pin packages and procedures that are heavily executed in the shared pool. This prevents the heavily used code from being flushed out and thus needing to be parsed in. 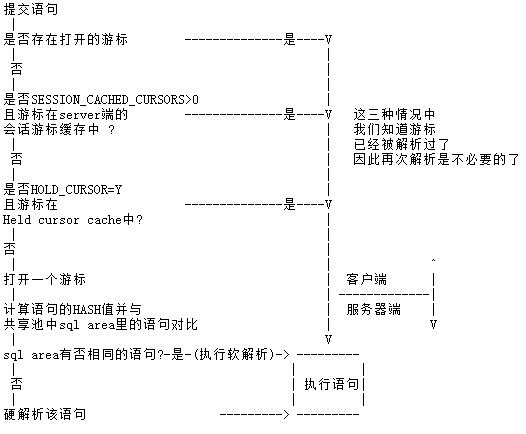 Increase SESSION_CACHED_CURSORS parameter. This helps if the user repeatedly parses the same statements. If using EXECUTE IMMEDIATE with bind variables, try using DBMS_SQL instead. If the statement is complex and heavily executed, the load on the library cache could be reduced by breaking it up into multiple smaller statements. Reducing the versions of SQL statements reduces the load on library cache as well. Oracle deals with various bind variable sizes by creating multiple versions of the statement. One possible solution would be writing more smaller queries rather than one large one. Specify objects over a certain size be loaded into the large pool instead of the shared pool. It’s possible that the shared pool is too small. If the above remedies have been attempted and contention is still evident, look into increasing the shared pool gradually. Please also refer to Oracle’s MetaLink’s Note:146599.1 for information on this latch. The library cache (a component of the shared pool) stores the executable (parsed or compiled) form of recently referenced SQL and PL/SQL code. Oracle tries to reuse this code. If the code has been executed previously and can be shared, Oracle will report a library cache hit. If Oracle is unable to use existing code, then a new executable version of the code must be built, which is known as a library cache miss. cache is part of the shared pool. The shared pool size is part of the VARIABLE SIZE value returned by querying V$SGA. will accept the default value and not change this parameter. The maximum value is 8.
type will always be stored in the same namespace. query them to derive information about objects. a. Describe and/or query one of the following tables.X$KGLDP: (Dependency Table) One entry for each object that this object depends on. For example, a view would depend on underlying tables or views. X$KGLTR: (Translation Table) Contains records explaining how names referenced by this object were resolved to base objects. X$KGLAU: (Authorization Table) Contains entries for each privilege defined on the object. X$KGLXS: (Access Table) One or more entries for each entry in the dependency table. X$KGLRD: (Read-only dependency table) Like the dependency table but for read only objects. X$KGLSN: (Schema Name table) Only cursors have schema name tables and they store the schema names for the objects in the authorization table. (Child Table) One entry for each object that is a child of this object. b. You can see the name of objects, their namespace, and flags by executing the following query. Since there are many objects the query is limited using the psuedo column rownum. letters LK, records locks on library cache objects. b. Create a second SQL*PLUS session as SCOTT/TIGER. The user SCOTT acquired object handles on the objects DBMS_APPLICATION_INFO and DBMS_OUTPUT. You will see that SCOTT has acquired additional locks as a result of the update statement. X$KGLPN table are obscure but you may want to take a look at the data. 8. Library cache contention can be caused by excessive parsing of SQL statements. appropriate level 1 – 4, depending upon the information you want to see. The output will be generated in the USER_DUMP_DEST directory. table can be used to identify what is causing the large allocation. The table contents are deleted after a SELECT. This is done because the table stores only the largest allocations that have occurred. KSMLRSIZ: amount of contiguous memory being allocated. Values over 5KB start to be a problem. KSMLRNUM: number of objects that were flushed from the shared pool in order to allocate the memory. KSMLRHON: the name of the object being loaded into the shared pool if the object is a PL/SQL object or a cursor. KSMLROHV: hash value of object being loaded. KSMLRSES: SADDR of the session that loaded the object. 13. An additional method to tune the library cache is to convert anonymous blocks into packages if possible. Stored objects And Transient objects are stored in the library cache, neither Temporary objects nor Permanent objects. The library cache is structured as a Hash table .But Library cache objects are composed of data heaps. Oracle access hash tables through hash buckets. SHARED_POOL_SIZE does the Oracle server determine the number of hash tables. When the the shared pool is larger, it can accommodate more object handles. _KGL_BUCKET_CNT can be used to set the number of hash buckets and deprecated. The minimum size of the hash table is 509 buckets in ORACLE 7. For performance reasons, when the linked list has an average depth of 2 the Oracle server doubles the size of the hash table. Locks manage concurrency whereas pins manage cache coherency. An object handle is protected by a latch determined by the bucket it hashes into using the formula latch# = mod(bucket#, #latches) . Begin 10.2.0.2, mutex take place cursor pin latch.To avoid using Mutex latches, you can set _kks_use_mutex_pin=false . CURSOR_SPACE_FOR_TIME has been deprecated in 10.2.0.5 and 11.1.0.7. CURSOR_SPACE_FOR_TIME was originally introduced to try and help reduce latch contention by keeping cursors in memory in the SGA rather than allowing their data to be flushed from the shared pool. Such latch contention is avoided in current releases by the use of cursor mutexes and so this parameter is no longer relevant.